Planting the foxglove seedlings en masse in the shade of the apple tree really worked. I didn’t have the labour to weed, but despite this it has looked good for the whole time of the foxgloves flowering. They sway dramatically in the wind as you can see from these two photos! I’ve put in a large photo so you can see all the wild detail. The white flowers of feverfew and oxeye daisies grow among them, and purple toadflax (linaria purpurea). Since this photo was taken, there are other things growing I hadn’t expected – verbascums (mullein) and inula (the wild flower name is elecampane). These have seeded from elsewhere in the garden, probably via birds. All are great for insects especially bees and hoverflies. The bumblebees are still ravishing the foxgloves, and now the hoverflies are coming out to play too. 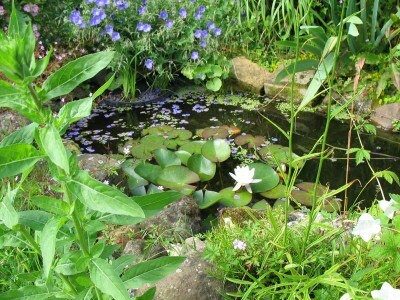 The wildlife pond looks great, with the newly divided waterlily now back to full size and flowering, with the geranium ‘Brookside’ in the background here, dropping its petals on the water.